I love playing games with kids. Before we left to visit Texas last September I ordered a few items from Barnes and Noble to be delivered to my parents' house. One of the games was a Color and Shapes Bingo. I finally opened it. When I bought it a few months ago, Blue Rock was too young for it. He still is kind of young for it but we gave it a go. He loved it! Blue Rock really loves shapes and lately has wanted to name every shape we see. 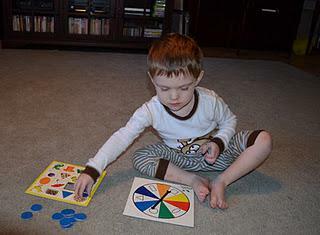 To play you spin the spinner which stops on a shape or color. Then you place bingo chips over the shape or color pictures that match. We didn't play the whole way through but he enjoyed playing it "right" for about 5 minutes. 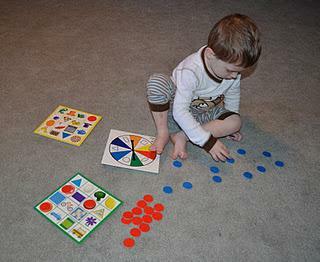 Then he wanted to play with the Bingo chips and spin the spinner and just name the pictures, shapes, and colors of the Bingo cards. I give this game an A+ and think we'll have more fun with it as he gets older.